League Delia Austrian Medal for Most Distinguished Performance by an Actor or Actress on the Broadway Stage, for Amadeus , 1980; Outer Critics' Circle Award, for Amadeus , 1980; Tony Award for Best Actor, for Amadeus , 1980; Royal Television Society Performer of the Year, for Walter and June , 1982; New York Drama Desk Award for Shakespeare acting, 1983; Plays and Players' Award, for Shakespeare acting, 1983; Society of West End Theatres (SWET) Award for Best Actor in a Revival, for Wild Honey , 1984; Peabody Award for Broadcasting, for Shakespeare Birthday Programme, 1984; Knighthood of the British Empire for services to the performing arts, 1991; Society of West End Theatres (SWET) Award for Best Actor of the Year, for Richard III , 1992; Cable Ace Best Supporting Actor, for And The Band Played On , 1993; Golden Globe Award Best Supporting Actor, for Rasputin , 1996; Felix Award, for European Actor of the Year, for Richard III , 1996; Golden Quill—the Sir John Gielgud Award for Excellence in the Dramatic Arts, Shakespeare Guild, 1996; Audie Award for Best Solo Performance 1997, for The Odyssey , 1997; Lifetime Achievement Ovation Award, Theatre L.A., 1998; The Independent Spirit Award, National Board of Review, Broadcast Film Critics Association, British Independent Film Awards, Los Angeles Film Critics Association, Chicago Film Critics Association, Florida Film Critics Circle, San Diego Film Critics Society, Toronto Film Critics Association, International Film Festival San Sebastian, The Saturn Award, The Chlotrudis Award, all for Best Actor, for Gods and Monsters , 1998 and 1999. McGillivray, D., in Films and Filming (Leicester), no. 377, February 1986. O'Toole, Lawrence, "Sympathy for the Devil," in New York Times Magazine , 5 April 1992. During the 1990s, Sir Ian McKellen emerged as Britain's preeminent film actor on the strength of his electrifying performances in such films as Richard III and Gods and Monsters. Demonstrating extraordinary versatility—playing classics and contemporary roles, from a fascist dictator to a gay Hollywood director—McKellen raised his long and highly acclaimed acting career to new heights, culminating in a 1999 Oscar nomination for Best Actor. In his native country, McKellen has long been recognized as one of England's greatest actors. His mastery of Shakespeare has made him the Bard's greatest late twentieth-century interpreter. He has played most of the great Shakespearean roles, often in productions set in modern dress. But his film career was slow to take off. The 27-year-old McKellen made his screen debut in 1966 playing a soldier in the unfinished and unreleased Mirisch Brothers World War I epic, The Bells of Hell Go Ting-A-Ling-A-Ling , starring Gregory Peck. It would be another two years before McKellen found his way into a film that made it to the theatres. In 1968, McKellen played the fur-clad, Viking-fighting Roger the Bandit in Clive Donner's Alfred the Great , starring David Hemmings and Michael York. That same year, McKellen played a more contemporary role, the small but pivotal part of a gay television host in A Touch of Love , a film about single motherhood in the 1960s. It would be another ten years before the actor was cast in a film role. In the interim, McKellen cemented his reputation on the stage, earning a CBE from Queen Elizabeth for his contributions to the theatre. In 1979, Ian McKellen finally found a role worthy of his talent—playing D.H. Lawrence in Priest of Love , with Janet Suzman, Ava Gardner, John Gielgud, and Sarah Miles. Looking uncannily like the real Lawrence, McKellen's performance as the celebratedly sexual author centered on his tempestuous relationship with his wife and his censors. He followed up his film performance with a Tony Award-winning portrayal of Salieri in Broadway's Amadeus in 1981. During the 1980s, McKellen appeared in four films, only two of which received any kind of significant theatrical release. In David Hare's Plenty (1986), McKellen had a supporting role as a British Foreign Service officer, Sir Andrew Charleson. But it was in Scandal that McKellen showed off his range by played John Profumo, M.P. Having just come out as a gay man, McKellen eagerly tackled one of history's most notorious heterosexuals in an effort to prove that gay actors can convincingly play straight roles. In 1991, Queen Elizabeth II knighted Ian McKellen—the first openly gay actor to be so honored. Following his knighthood, McKellen's film career skyrocketed. During the 1990s, he made seventeen films, almost doubling his entire film output of the previous three decades. The highlights from the decade were undeniably Richard III and Gods and Monsters , but McKellen also turned in dazzling performances in a wide range of films such as Swept from the Sea , Restoration , And the Band Played On , and Six Degrees of Separation. In John Schlesinger's Cold Comfort Farm , McKellen played the depressive head of the Snakeadder clan turned fire-and-brimstone traveling preacher with a subtle lampooning wit and great good gusto. McKellen had starred as the Max in two productions of Bent , including the world premiere. For Sean Mathias's film version, McKellen played the supporting role Max's Uncle Freddie. In the Emmy Award-winning HBO miniseries, Rasputin , McKellen's nuanced portrayal of the doomed and desperate, yet tyrannical Tsar Nicolas II earned the actor a Golden Globe and an Emmy nomination for Best Supporting Actor. But it was McKellen's sizzling performance as Richard III in the 1996 film that finally brought the actor's world-class Shakespearean talent to the big screen. Based on McKellen's stage production, Richard III was set in the 1930s, with the famed hunchback monarch transformed into a charismatic yet malcontent fascist dictator whose global ambitions are supported by his black-shirted thugs. The successful Richard III seemed to open Hollywood's eyes to the extraordinary possibilities of Ian McKellen, film star, and the 59-year-old actor was cast as Nazi war criminal-in-hiding, Kurt Dussander, in Apt Pupil. 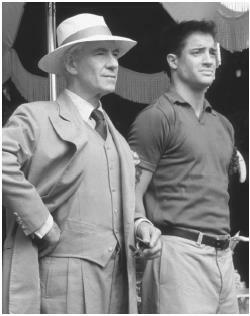 But it was McKellen's exquisitely moving and subtle portrayal of gay Hollywood director James Whale in Gods and Monsters that earned the British actor the widespread admiration of American audiences. In the twilight of his life, the retired Whale's fascination with his handsome and very heterosexual gardener (Brendan Fraser) is movingly yet unsentimentally portrayed by McKellen, who earned a Best Actor nomination from the Motion Picture Academy. Now in his sixties, McKellen continues to be a Hollywood darling, slated to star as Gandalf in Lord of the Rings and he portrayed the mutant leader Magneto in X-Men in 2000. One can only wonder what film performances McKellen could have given had his cinematic talents been recognized as quickly as his theatrical gifts were. Fortunately, he has many more decades to construct a lasting film legacy.